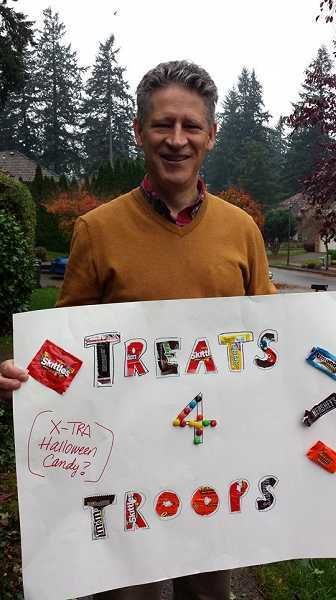 As school children across the area went door-to-door collecting candy on Halloween, Tualatin’s Daniel Payne went with them. But Payne isn’t your typical trick-or-treater. The 57-year-old Tualatin resident collected candy for the Tualatin Veterans of Foreign Wars Post 3452. Payne, vice president of the VFW Post’s Men’s Auxiliary, worked with student volunteers and members of the Tualatin Chamber of Commerce to collect as much candy as they could. But that wasn’t all. The VFW also donated $500 to the organization to help pay for the cost of shipping the care packages. The packages include necessities that troops may not have access to, including laundry detergency, entertainment items, and personal hygiene products such as deodorant, toothpaste and body wash as well as food items for troops who often survive on military rations, known as MRE’s. The packages also include items to help boost morale, such as letters, photos and other items to help troops remember there are people thinking of them back at home, Lamare said. Payne said he and the rest of the VFW are just doing their part to support local troops — work that wouldn’t be possible without the community. Payne’s father served in the military during World War II and the Korean War. Payne said the care packages mean a lot to servicemen and women who are far from home. The care packages should be shipped before Christmas, Lamare said.